Married couples enjoy a harmonious and eternal relationship when they remain true to the Lord and to each other. “The relationship between Brother Kimball and his wife was something I admired very much. 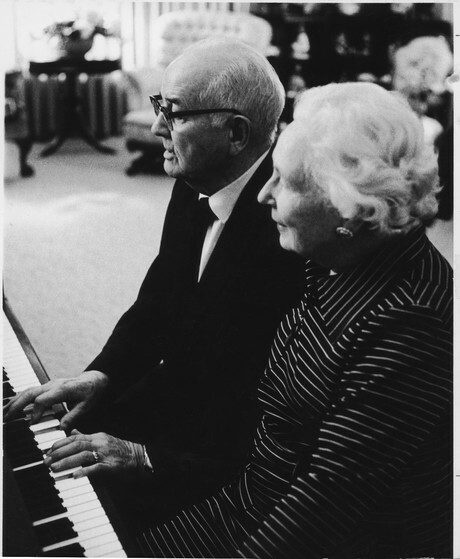 When Eddie was in California, receiving extended treatment, Sister Kimball stayed with him and President Kimball traveled there at critical times. During periods of recuperation following Eddie’s surgery, Brother Kimball would return home to take care of the rest of the family, while his wife stayed with Eddie. “I believe he wrote to her every single day. Not just a short 50-word letter, either. Sometimes when he was particularly pressed for time he would dictate a letter to me, and I remember how I felt: it was almost a sacred honor. Eternal marriage is ordained of God, and the family is essential in Heavenly Father’s plan for us. Honorable, happy, and successful marriage is surely the principal goal of every normal person. Marriage is designed of the Lord to make strong and happy homes and posterity. Anyone who would purposely avoid marriage is not only not normal, but is frustrating his own program. I defend the term normal because the Lord set the norm himself by bringing together Adam and Eve, his first male and first female on this earth, and performing a holy marriage ceremony to make them husband and wife. They were quite different in their makeup, with different roles to play. Hardly had he performed the ceremony than he said to them: “Multiply, and replenish the earth, and subdue it: and have dominion” (Gen. 1:28). This is the proper way. I sincerely hope that our Latter-day Saint girls and women, and men and boys, will drink deeply of the water of life and conform their lives to the beautiful and comprehensive roles the Lord assigned to them. Eternal marriage requires careful preparation. Marriage is perhaps the most vital of all the decisions and has the most far-reaching effects, for it has to do not only with immediate happiness, but also with eternal joys. It affects not only the two people involved, but also their families and particularly their children and their children’s children down through the many generations. Married couples can follow a never-failing formula to find happiness together. The mere performance of a ceremony does not bring happiness and a successful marriage. Happiness does not come by pressing a button, as does the electric light; happiness is a state of mind and comes from within. It must be earned. It cannot be purchased with money; it cannot be taken for nothing. There is a never-failing formula which will guarantee to every couple a happy and eternal marriage; but like all formulas, the principal ingredients must not be left out, reduced, or limited. The selection before courting and then the continued courting after the marriage process are equally important, but not more important than the marriage itself, the success of which depends upon the two individuals—not upon one, but upon two. In a marriage commenced and based upon reasonable standards … , there are not combinations of power which can destroy it except the power within either or both of the spouses themselves; and they must assume the responsibility generally. Other people and agencies may influence for good or bad. Financial, social, political, and other situations may seem to have a bearing; but the marriage depends first and always on the two spouses who can always make their marriage successful and happy if they are determined, unselfish, and righteous. Unselfishness and observance of the commandments lead to success in marriage. Marriage requires total allegiance and total fidelity. I plead with all those bound by marriage vows and covenants to make that marriage holy, keep it fresh, express affection meaningfully and sincerely and often. Husbands, come home—body, spirit, mind, loyalties, interests, and affections—and love your companion in an holy and unbreakable relationship. Review the section that begins on page 191. What are some influences in the world today that you consider antimarriage? What effects are such attacks having? What can we do to “offset and neutralize” them, particularly in our homes? Which teachings of President Kimball about preparing for eternal marriage impress you the most and why? (See pages 193–95.) Which teachings might help those who are already married? President Kimball spoke of a “never-failing formula” for marriage (pages 196–97). If any one of the ingredients is missing, how might a marriage be influenced? President Kimball taught that spouses should “cleave” to each other and none else (pages 199–200). What can married couples do to ensure that outside commitments and interests do not interfere with their allegiance to each other? In “President Spencer W. Kimball: On the Occasion of His 80th Birthday,” Ensign, Mar. 1975, 6, 8. In Caroline Eyring Miner and Edward L. Kimball, Camilla: A Biography of Camilla Eyring Kimball (1980), viii. The Teachings of Spencer W. Kimball, ed. Edward L. Kimball (1982), 310. In Conference Report, Apr. 1979, 5–6, 7; or Ensign, May 1979, 6. “Marriage Is Honorable,” in Speeches of the Year, 1973 (1974), 266. The Miracle of Forgiveness (1969), 243. “The Importance of Celestial Marriage,” Ensign, Oct. 1979, 5. “The Lord’s Plan for Men and Women,” Ensign, Oct. 1975, 4–5. “Oneness in Marriage,” Ensign, Mar. 1977, 3, 4. In Conference Report, Stockholm Sweden Area Conference 1974, 10. The Miracle of Forgiveness, 249. “The Marriage Decision,” Ensign, Feb. 1975, 6. Ensign, Mar. 1977, 3, 4. In Conference Report, Oct. 1975, 6; or Ensign, Nov. 1975, 6. Ensign, Mar. 1977, 4, 5. Faith Precedes the Miracle (1972), 142–43. Faith Precedes the Miracle, 143. Faith Precedes the Miracle, 148.